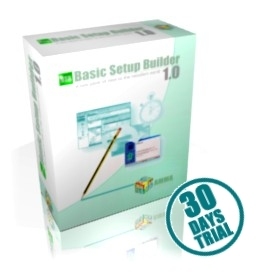 Download "Basic Setup Builder 1.0"
You can try Basic Setup Builder 1.0 for 30 days. During this period the package is fully functioning. However a 'Trial alert' window will be included into all the built installers and it will be displayed at every installation startup. This setup program will add a 30-days trial period to the installed packages of older version.